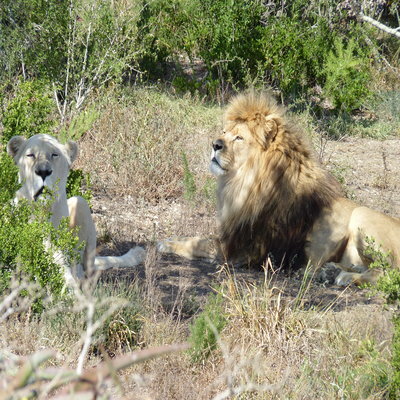 We recently introduced two of our rescued lions – Brutus and Queen – so they can live together at our Big Cat Rescue Centre at Shamwari Private Game Reserve in South Africa*. Brutus arrived at Shamwari in 2008, after being rescued from a circus in France where he lived in a two-metre cage. Queen is an ex-breeding farm lioness who arrived at Shamwari in 2015. Both big cats had been living on their own following the death of their partners – most recently Marina last summer. The introduction took a great deal of careful planning and work. Queen lived in an enclosure alongside Brutus for several months before the pair were fully introduced. This allowed them to meet and spend time in each other’s company first, with the safety of a fence between them. During this time, the team observed Queen and Brutus to assess whether or not the pair could be compatible to live together. After careful consideration, two weeks ago, we opened up the enclosure and Brutus and Queen are now living together peacefully. Maggie Balaskas, Born Free’s Animal Rescue and Care Manager, said: “The Animal Care team at Shamwari spent many months observing Queen and Brutus, as they got to know each other as neighbours. Born Free, in partnership with Shamwari Private Game Reserve, operates two sanctuaries at Shamwari Private Game Reserve for lions and leopards rescued from zoos, circuses and other captive facilities. You can find out more about Shamwari and the big cats in our care here. * None of our rescued animals in permanent care are allowed to breed. We vasectomise males or spay/give hormone implants to females. We do not want to add to the captive population, plus sanctuary space is in short supply, so we keep these precious spaces for animals most needing rescue.